Jason Howe is a fine artist, illustrator and designer whose work reflects not only his love of post-pop surrealism but also his appreciation of traditional drawing and painting techniques. With a combination of poignancy, innocence and playfulness always present in his style, Jason draws endearing characters in vivid worlds. His painterly approach warrants a high standard in the production of cute characters for a wide use of subjects and is comfortable and competent in traditional and digital techniques, generating large-scale murals, vector work or watercolors. 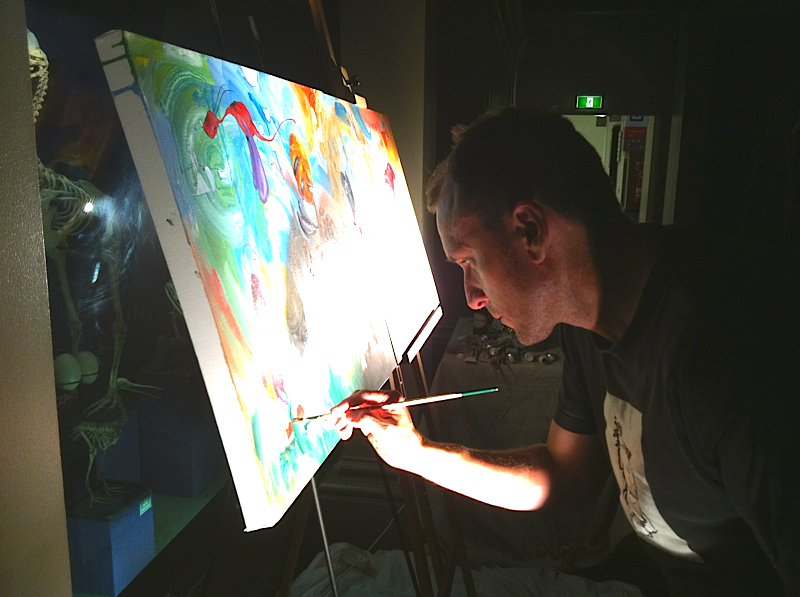 Jason was born near the southern beaches of Sydney, Australia and started drawing at an early age in front of the TV. With one hand grasping a crayon the other was dipping a spoon into his breakfast cereal while watching his favourite Saturday morning cartoons. Drawing on his passion for Warner Brothers and Disney cartoons, newspaper comic strips, the street art characters of Vaughn Bode and skateboard graphics of the 80’s and 90’s, these styles and influences have been swept up into his imagination and now, whether it’s ball point pen, oils, acrylics even Photoshop, these post-pop-hip-hop doodles dance their way onto paper, panel and pixel and reveal themselves as a delightful abundance of character driven fine art. Now based on the south coast of N.S.W. Jason has exhibited in many solo and group shows in several of Australia's major cities and the US over the last 20 years. He is also a founding member of Sketch The Rhyme, an audio/visual performance collective that has taken its improvised speed drawing hip-hop shows around Australia, performing at festivals in Adelaide, Sydney, Melbourne and Brisbane. As well as studying and practicing the fine arts he has recently completed the Advanced Diploma of Illustration and Design at Enmore Design Centre, where he was privileged to win the coveted prize for Best Illustration Technique. His first of many children's picture books, Congo Rock, which he designed and illustrated, was published in July 2014. Whether they be playful people, animals- anthropomorphic or otherwise, sprites and beasties of the faerie world, Jason’s drafting skills combined with his training in the fine arts, illustration and design will transport you to familiar situations, evocative realms and to places we have grown up with but were just out of reach. And because of these combinations in his illustrations, readers of all ages find that they are drawn by Jason. 1992 Dux of Associate Diploma in Fine Arts, Southern Sydney Institute of TAFE.